August 21, 1964, The Beatles were embarking on the Seattle leg of their first world tour. 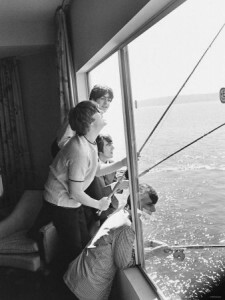 After other hotels in the city apparently refused to accept them as guests, The Edgewater Hotel happily welcomed "The Fab Four". 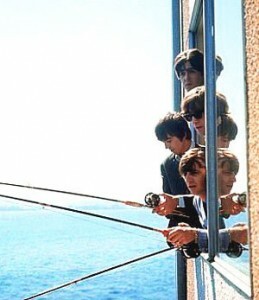 During their stay, the band famously fished from the window their suite, the photo of which has become legendary. “Beatlemania" so consumed the city that The Edgewater had to install fencing around the hotel to keep the screaming fans at bay. Some fans even tried swimming across Elliott Bay to reach the band. "The Beatles Suite", is room 272, a parlor room where John Lennon, Paul McCartney, George Harrison and Ringo Starr originally stayed. It has now be turned into a 700-square foot shrine to all things Beatles, mostly in the form of photographs and Beatles CDs. 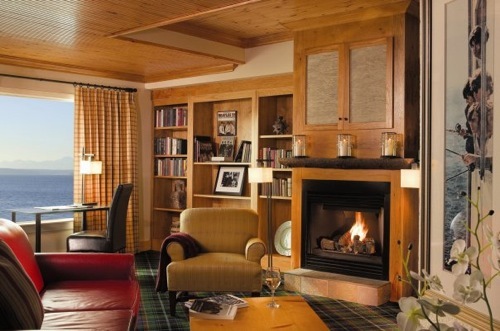 It books for $1,050 per night plus taxes. 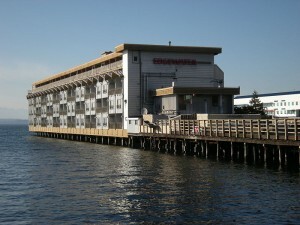 This is also the same hotel that Led Zeppelin got banned from for the famous "Mudshark Incident" or "The Shark Episode" which took place at the Edgewater on July 28, 1969. "The Shark Episode" is alleged to have involved some type of sexual act with a fish. However, there are many variations on the story, all involving one or some of the band members, as well as variations of the type of fish (often claimed to be a shark), and the nature of the acts performed. Read more about that incident below. Led Zeppelin Infamous Seattle Groupie Incident…Was It A Mud Shark Or A Red Snapper?? ?